Professional writers can write with authority about subjects they know little about. But if you’re asked to write about issues with a personal connection they can really get the story-telling juices flowing. I knew about respiratory disorders before I started writing about COPD (chronic obstructive pulmonary disease) in press releases and brochures for GCE Healthcare last year. Unfortunately I didn’t have to reach far to understand how people with breathing difficulties rely on oxygen and are able to be more mobile with portable equipment. Respiratory disorders run in my family. Both grandparents had severe asthma, as does my brother. My parents survived tuberculosis in the 1960s but two years ago mum’s life was shortened by lung cancer. It is very hard to watch someone you love fight for every breath. In her final weeks, mum had a large oxygen cylinder to use at home, which was pretty unwieldy. A portable oxygen concentrator gives those with respiratory disorders more independence and mobility, helping them to get out and about for as long as they are able. The process of writing is essentially the same, whether I’m writing about a subject I know nothing about or writing about COPD, which I know something about. When you have a personal connection with whatever you’re writing, the main difference lies in the amount of research you need to do. Instead of researching a subject from a standing start, you have a head start – saving some initial time spent. Another plus is knowing the readership. Every copywriter knows they have to adapt what they’re writing to the audience they’re writing for and it helps to have some sympathy with them. But if you already have some inkling of what the readers are going through you can write with empathy. 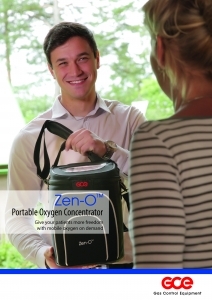 You can read the copy I wrote about COPD and Zen-O portable oxygen concentrators in the GCE Healthcare Zeno_Brochure. To find out more about lung conditions and COPD visit the British Lung Foundation.